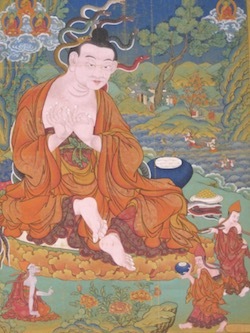 Madhyamaka (Skt. ; Tib. དབུ་མ་, uma, Wyl. dbu ma) refers to both the state of the Middle Way as well as the texts that express this ultimate meaning such as the Mulamadhyamaka-karika by Nagarjuna. The wise do not dwell even in the middle." The meaning expressed by the term Madhyamaka is, we could say, the sphere of reality (dharmadhatu), beyond all extremes. the Fruition Madhyamaka, the unity of the two kayas. The Ground Madhyamaka, the unity of the two truths, is beyond all extremes because it is beyond the extremes of eternalism and nihilism. The Path Madhyamaka, the unity of skilful means and wisdom, is beyond the extremes of exaggeration and denial. The Fruition Madhyamaka, the unity of the two kayas, is beyond the extremes of samsaric existence and the peace of nirvana. See also Madhyamika for the Middle Way philosophical tenet system and its followers. Khenpo Tsultrim Gyamtso Rinpoche, May 1982, London, St Paul’s Crescent, 'Madhyamaka, Philosophy in Practise'. This page was last edited on 15 January 2019, at 09:17.